Bing has started the process of removing sidebar text adverts from its search results, inline with a change Google made back in February 2018. The process for Bing started towards the end of March, and is being propagated first to the US, before spreading internationally. Internationally, sidebar ads will be moved at a later date. 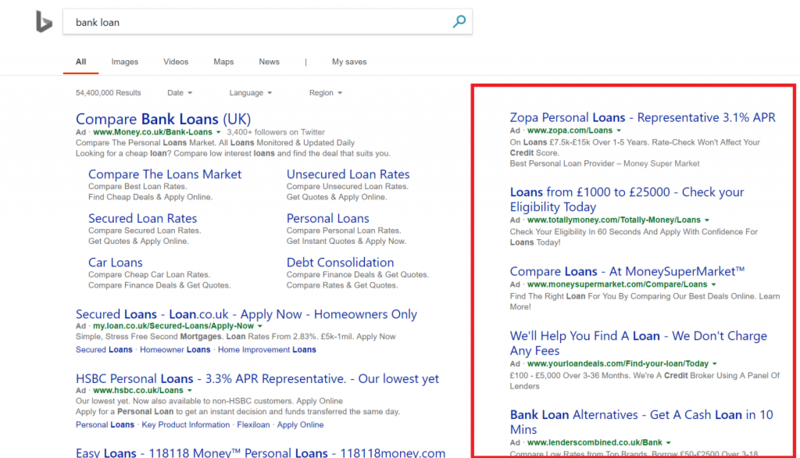 Bing’s testing illustrated that the removal of sidebar text adverts increased the overall clicks gained for Bing Ads advertisers, especially for those using mainline text ads and product ads. The bottom of search engine results pages (SERP) will allow richer ad formats, improving the click through rates for adverts at the bottom of SERP. The number of adverts at the bottom has also increased from 3-4 adverts. Text adverts will not appear on the sidebar anymore. However, product ads will still be showing for the sidebar. It is interesting that Bing have decided to make such a change. Back in February 2018, Google decided to completely remove sidebar adverts from its SERP, whilst increasing the maximum adverts allocated above organic search results from 3-4 adverts. Reduced revenue – Since Bing ads, above organic search results, are at a maximum of four adverts already, removing the sidebar of ads will result in less ads displayed on the SERP. Bing cannot increase the number of ads from 4 to 5, since this will be far too many adverts above organic results. Copying Google – Since Google has found keeping sponsored products in the sidebar proves effective, Bing might follow suite just for that reason, along with some sort of conclusive testing. Lack of risk taking – Removing the sidebar ads comes with a risk. It is counter-intuitive to have less adverts displayed and get more clicks onto the adverts. Google states this is the case for them. Maybe Bing are still a little unsure. Lack of testing – The conclusion Bing have come to is that text adverts in the sidebar are not beneficial for Bing, the web user or advertisers. On the other hand, product ads have not been mentioned with regards to them in the sidebar. Have Bing got a lack of conclusive testing to completely remove the sidebar? Potentially. Whatever the case, it appears that Bing are playing catch up to Google at the moment and are struggling to stay ahead of the competition. Google is a much more pleasant experience when searching the web, in my opinion, just from the lack of a sidebar clogging up results and making the page look cluttered. If this is anything to go by, it should be no surprise to see the sidebar in Bing completely removed of adverts as a whole, so that Bing can compete better against Google, both in terms of a search engine and as a PPC advertising network.